Offline Aadhaar e-KYC: The past, present and future of AADHAAR eSIGN? In the next few weeks, the Controller of Certifying Authorities (CCA) is expected to roll out an Offline Aadhaar e-KYC enabled eSign. This will possibly replace the current Aadhaar eSign process. The CCA regulates the working of Certifying Authorities (CA), who issue digital signature certificates for electronic authentication of users. In this post, we briefly look at the past, present and the near future of Aadhaar eSign and what it means for businesses looking to digitize their documentation process. Read further What is Aadhaar eSign? Aadhaar eSign has seen rapid adoption by businesses, with around 50 million signatures issued in the past three years. 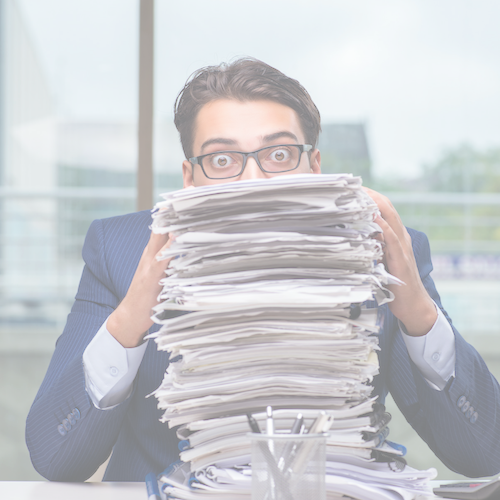 Inherent to its rapid adoption is the faith of businesses in digitization and the immense value it adds by reducing the cost and time associated with paper documents. Read further How can you utilize Aadhaar eSign for your business? The Government of India gave Aadhaar eSign legal backing in early 2015, by way of a notification issued under the Information Technology Act 2000. From 2015 to September 2018, Aadhaar eSign sailed smoothly with widespread and aggressive adoption. While fintech companies and stock brokers were the earliest adopters of this service, Aadhaar eSign was rapidly gaining acceptance even among the traditionally more technology averse businesses. Towards the end of September 2018, the Supreme Court of India passed an order on the constitutional validity of Aadhaar authentication. While the Court upheld the constitutional validity of the Aadhaar Act 2016, it curtailed the extent to which Aadhaar authentication could be undertaken by state and private entities. In particular, the Court declared it unconstitutional to conduct Aadhaar authentication merely by way of a contract, without the backing of a law. This decision was received with bouquets and brickbats in equal measure. Aadhaar eSign was not discussed in the Supreme Court’s order and therefore faced no immediate scrutiny or disruption. Stakeholders in the eSign process were also of the understanding that Aadhaar eSign was in compliance with the court’s order as the use of Aadhaar authentication (for e-KYC) in generating eSigns was backed by the Information Technology Act 2000. This understanding was further bolstered by absence of any communication or guidance from UIDAI /CCA for close to two (2) months subsequent to the order. The first assault on the Aadhaar eSign came at the end of November by way of National Payments Corporation of India’s (NPCI) announcement suspending Aadhaar eSign based e-mandates. These e-mandates had seen rapid adoption due to their low failure rates and significant reduction in registration time, when compared to their paper alternatives. 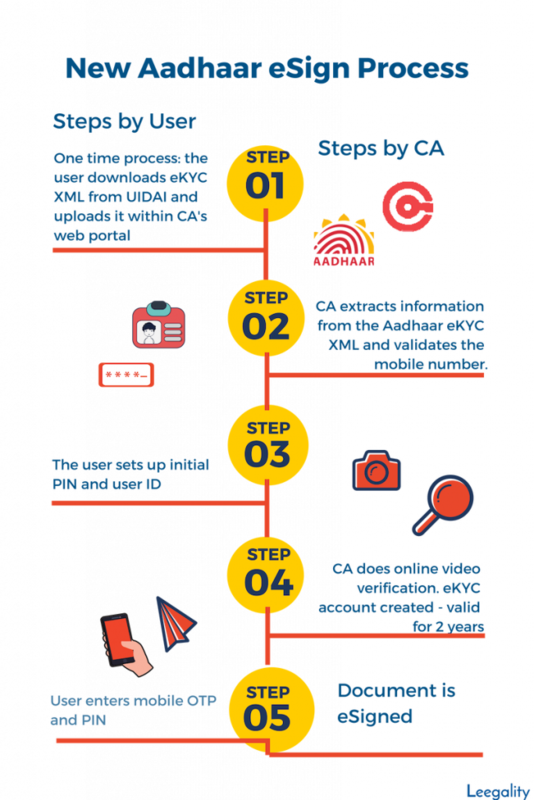 On 29 November 2018, the CCA released its revised ‘Identity Verification Guidelines’ introducing Aadhaar Offline eKYC for issuance of a Digital Signature Certificate (DSC) to the users. Simultaneously, the CCA has initiated the first steps to discontinue the current Aadhaar eSign process, though a final decision is pending as the Union Government has reportedly sought a legal opinion from the Ministry of Law and Justice. How is Aadhaar Offline e-KYC enabled eSign generated? However, the operational nitty-gritties of the new Aadhaar eSign have not been settled. Compared to the current Aadhaar eSign, the use of the new Aadhaar eSign will require a higher level of digital literacy, though nothing that some hand-holding and awareness can’t overcome. Further, businesses which were waiting on the sidelines due to the long pending Supreme Court case can now proceed with the new eSign process as it does not involve an online Aadhaar authentication. The new Aadhaar eSign process can be used for signing contracts (with business partners, employees and borrowers etc. 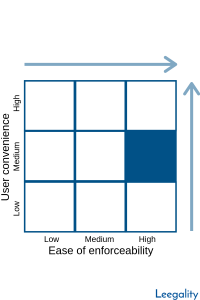 ), customer onboarding forms, regulatory forms, invoicing etc. Sectors like SME finance (where the ease of enforceability of contracts may be of foremost importance) will find the new Aadhaar eSign very attractive. Other methods of digital authentication such as ‘Virtual Signatures’ may also be a viable alternative to Aadhaar eSign and paper-based hand signatures, especially for routine documents such as approval letters, onboarding forms and HR documents. These eSignatures can be paired with the Instant eStamp services offered by Leegality.com for an end-to-end digital document workflow. Reach out to us at contact@leegality.com for more details on Aadhaar eSign, Virtual Signatures and Instant eStamp Gateway. Originally published at The Leegality Blog. Co-founder at Leegality.com, Legal-Tech Entrepreneur, Recovering Lawyer. This publication is one-stop knowledge database for information related to Aadhaar eSign and documentation digitization. Attempts to covers all technical, legal, regulatory, data security and business aspects of legal digitization.